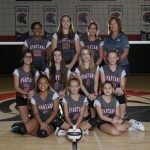 Girls Middle School Volleyball · Jul 31 Tryouts start Monday! Tryouts start Monday. Can’t wait to see everyone. Encourage all your friends to come out on Monday. Don’t forget to get your physical!! Text me if you have any questions 480-241-8624.